On Tuesday's Anderson Cooper 360, CNN contributor Roland Martin strongly pushed for the Democrats to "stand up and protect the Constitution" by defending the planned New York City mosque near Ground Zero: "Democrats should get some spine and say, 'You know what? I am sworn to uphold and protect the Constitution. '...Stay strong- say it's about the Constitution." Substitute anchor John Roberts brought on Martin, along with Republican strategist Ed Rollins and CNN senior political analyst David Gergen, to discuss the continuing controversy surrounding the mosque project. The anchor first turned to the black talk radio host and asked, "Roland, is this the sort of thing that Democrats want to be talking about right now, at a point where many people form their opinions of who they're going to vote for in November?" Martin didn't begin with his "constitutional" argument, but instead emphasized that Democratic candidates needed to focus on local issues: "Frankly, if I'm a Democrat and somebody comes to me with that question...I say, 'Hey, go talk to...the folks representing New York. I'm here talking about my district.'" Both Gergen and Rollins disagreed with their fellow guest. When the strategist stated that "there's going to be some seats lost over this issue," Martin doubled down on his initial point: "You've got school districts laying off hundreds of thousands of teachers. And you're actually going to say, 'I'm going to vote for somebody based upon this issue'- to me, that's nuts. You vote on what's happening where you are." The CNN contributor then went right in his proposed strategy about making it a constitutional issue and echoed the argument of The Washington Post's David Ignatius: that the President shouldn't have backed away a bit from his initial statement on the issue on Friday: "Democrats should get some spine and say, 'You know what? I am sworn to uphold and protect the Constitution.' The President was strong on that on Friday. I think he blew it on Saturday by walking it back. Stay strong- say it's about the Constitution, because every member of Congress, they are supposed to stand up and protect the Constitution." Martin continued on this point throughout the remainder of the segment. Refreshingly, Gergen pushed back and disagreed: "I increasingly believe it may come back to haunt him [President Obama] over time....there was a sense that this is another example of people thinking, 'He doesn't understand me. He's not like me. He sees the world through different glasses than I do.'" Later, after Martin rephrased his point and stated that "it is amazing how he's criticized for saying it is a constitutional right- to freedom of religion," the senior political analyst retorted by basically endorsing the main argument of the mosque opponents: "It is not simply a constitutional issue. It has to do with the sensitivities and sensibilities of a lot of families who lost loved ones there for whom this is hallowed ground. And a lot of Americans are saying, basically- look, if they've got real problems with it, I would rather they'd move it somewhere else." Earlier in the segment, as he introduced the controversy, Roberts didn't use the word "mosque" to describe it, labeling it instead as a "planned Islamic community center and prayer space down on Park Place in lower Manhattan, two blocks northeast of the Ground Zero site, another two blocks south of a mosque that's been in that area since 1970, before there even was a Twin Towers." ROBERTS: We're talking tonight about the planned Islamic community center and prayer space down on Park Place in lower Manhattan, two blocks northeast of the Ground Zero site, another two blocks south of a mosque that's been in that area since 1970, before there even was a Twin Towers. Sixty-eight percent of Americans surveyed by CNN/Opinion Research Corporation oppose it. In other polling, so does a smaller majority of New Yorkers. A narrow majority of Manhattanites say they support it. Believe it or not, when the local community board voted on it, the result was 29-1 in favor, with 10 people abstaining. It seems the farther you get from the location, the closer you get to election day, the hotter the opposition becomes. Well, that's 'Raw Politics' for you, and here to talk about all of that: political analyst Roland Martin, political contributor/GOP strategist Ed Rollins, and our senior political analyst David Gergen. Good evening to you all, gentlemen. Roland, is this the sort of thing that Democrats want to be talking about right now, at a point where many people form their opinions of who they're going to vote for in November? ROBERTS: Well, if only Harry Reid had said that, instead of what he said. So Harry Reid is another Democrat, David Gergen, who's distancing himself from the President. Do you believe, as time goes on, now that the White House has weighed in on what was a local issue, you'll see more Democrats looking to put some space between them and the President? DAVID GERGEN: I think so, yes. There are a lot of Democrats that, of course, would like not to talk about this. Roland is right about that. But when it becomes a big national controversy, and you're running for a Washington office- you know, it seems to me it's totally legitimate for the press or their opponents to ask them, what do you think about this issue? I think that- you know, it's like one of the issues you're going to have to deal with when you're in national life. ROBERTS: Is it a defining moment for this president? ROLLINS: Yeah, I think there will. I think there's- I think you're down to where these seats are a couple hundred votes. I think people are distracted by they can't talk about the things they want to be talking about, as Roland said, and I think this is an issue that's not going to go away. It's going to get bigger as time goes on, and- you know, it shouldn't be, but I think it will. ROBERTS: Do you agree, Roland? It's going to cost the Democrats some seats? MARTIN: No. No. I think if you're sitting here voting- if you were in any other place in America and your district is broke, you've got people who are- increasing number of Food Stamps. You've got school districts laying off hundreds of thousands of teachers. And you're actually going to say, 'I'm going to vote for somebody based upon this issue'- to me, that's nuts. You vote on what's happening where you are. And I will also say this here. Democrats should get some spine and say, 'You know what? I am sworn to uphold and protect the Constitution.' The President was strong on that on Friday. I think he blew it on Saturday by walking it back. Stay strong- say it's about the Constitution, because every member of Congress, they are supposed to stand up and protect the Constitution. ROBERTS: David, you've been here- I'm not sure if you're nodding your head or shaking your head or a little bit of both. MARTIN: David! David, the one point of view is the Constitution! MARTIN: Wow! That's not the one point of view! GERGEN: That's not the only issue. ROBERTS: Which are not looking good. ROLLINS: And they're 52 percent- 42 percent today in the Gallup, back to the Nixon and the Reagan levels now. If he drops another two or three points, which he clearly could- and this is a defining- could be a defining moment- he's going to hurt his party. And I say people are going to lose seats. The whole thing is about 3 percent or 4 percent out there. And our base is energized already, and this is going to energize some conservatives, some Tea Party people. ROBERTS: But the point has been made, though- but the point has been made, Roland- let's get you to speak to this- that the GOP could also lose something over this, because they're trying, obviously, to get as many votes as they can. There's a large section of the Muslim population that presidential candidates and, obviously, local candidates court in Dearborn, Michigan. How are Muslims in this country going to feel about what the GOP are saying these days? MARTIN: Well, obviously, frankly, people really haven't cared what they thought since 9/11, whether you're a moderate Muslim- and folks have just blown them away and dismissed them and said they're absolutely irrelevant. And so, sure- bottom line is if you're Republicans, you're trying to lock up those freshman Democrats who won in conservative districts, and that's really who you're really targeting. But it is amazing to me, though, when you have folks on the right who have attacked this president by saying, he's not one of us and doesn't understand our values, and when he does actually reinforce the Constitution, then it's a bad thing. I get the whole political thing, but maybe- but it is amazing how he's criticized for saying it is a constitutional right- to freedom of religion. That's pretty interesting. GERGEN: It is not only- it is not simply a constitutional issue. It has to do with the sensitivities and sensibilities of a lot of families who lost loved ones there for whom this is hallowed ground. And a lot of Americans are saying, basically- look, if they've got real problems with it, I would rather they'd move it somewhere else. 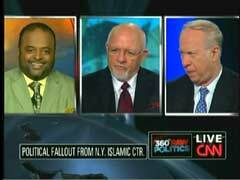 ROBERTS: Roland Martin, David Gergen, Ed Rollins, thanks for coming up- appreciate it.